Hand-Scraped Distressed Alvarado Hickory Click-Lock Engineered Hardwood Flooring creates a warm, welcoming ambience in any residential interior. Featuring rich, natural woodgrains in beautifully random patterns and a hand-scraped finish for a rustic touch, these boards are certain to add space-defining allure to your home. The substantial planks are 3/8 in. thick and have the versatility to be installed on any level of the house using glue or simply floating over a subfloor. Protection from everyday wear comes courtesy of a seven-layer aluminum oxide finish for utmost resilience to your family’s foot traffic, allowing the floors to retain maximum luster. This product has earned GREENGUARD Indoor Air Quality Certification and has been tested for more than 10,000 volatile organic compounds, including formaldehyde, to meet these standards. 26.25 sq. ft. per case. Case quantity: 16. Case weight: 38 lb. 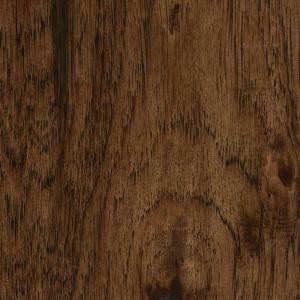 Buy online Home Legend HandScraped Distressed Alvarado Hickory 3/8 in. T x 5 in.W x 47-1/4 in. L Click Lock Hardwood Flooring(26.25 sq.ft/case) HL154H, leave review and share Your friends.